On the 100th anniversary of John Wayne's birth, the Duke still swaggers through the American psyche as not just an actor, but a patriot - his centennial spawning fond remembrance, and perhaps a few small protests on the side. He seldom deviated from heroic roles, often set in the West or on the battlefield. 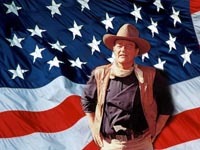 Among his most beloved and acclaimed films are "Stagecoach" (1939), "Sands of Iwo Jima" (1949), "The Searchers" (1956) and "The Man Who Shot Liberty Valance" (1962). His range was limited, but he mined a narrow path of the reluctant but obligated hero - a consistent approach that furthered his iconic stature. It's a notably different - and perhaps dated - tactic in a profession that values, above all, malleability. If you want to be an actor, study Brando. But if you want to be a movie star, study Wayne. She will host an evening presented by the Academy of Motion Picture Arts and Sciences in Los Angeles on Thursday, where a new restoration of "The High and the Mighty" (1954) will be shown. "There's a generation of Americans that kind of grew up with Wayne, matured with Wayne and grew old with Wayne, through all the trials and traumas of modern American history - and in doing so, found in him a voice they understood."